The project requires the closing of Waveland between Milwaukee Avenue and Lowell Avenue to allow for a regulation-size soccer field, which would measure 300 feet long and 195 feet wide, with a 10-foot clearing on each side. “If the field meets those standards, they can have sanctioned games at the school,” Arena said. The new field would be built on site of the school’s grass field, which is located immediately north of the school, 3601 N. Milwaukee Ave. The field is across from the former Riddell football helmet factory site- where construction of 49 single-family homes is expected to start next year. The committee also is being asked to make a recommendation on the final design of the field, where proposals for a softball diamond, tennis court of children’s playground are among the plans being considered for the field’s northeast section. The committee will include area residents and a representative from the Schurz High School Local School Council and the Old Irving Park Association. Waveland, a two-way street, is used by many residents to access the Old Irving Park neighborhood to the east and north of the school. Several of the area’s side streets are one-way. Some residents at the meeting asked if a portion of Waveland could remain open, especially if it were converted to a one-way street, or if the soccer field were reduced in size. Arena said that the one-way option for Waveland has been considered but that traffic on Waveland would be too close to the soccer field, creating an unsafe condition for players. He added that not using the street would result in a soccer field that does not meet Illinois High School Association standards. A project site plan shows the installation of a cul-de-sac near Waveland and Lowell, a one-way street that runs along the east side of the field. The size of the turnaround would depend on whether school buses would be using it. Currently as many as three buses drop off special needs students on Waveland, just to the east of the athletic field, and those buses access Waveland from Milwaukee. An alternate route for the buses would be to access Waveland from a side street that intersects with Addison Street to the south or Irving Park Road to the north, and the buses would then use the turnaround so that the students could be dropped off on the south side of Waveland, said transportation department engineer Craig Jakobsen. 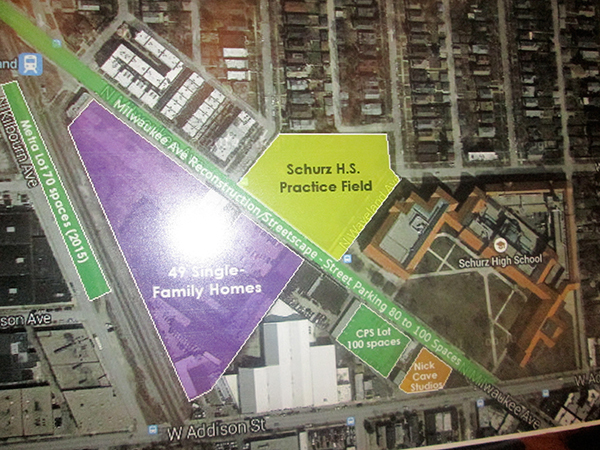 Schurz principal Daniel Kramer announced at the meeting that he will probably relocate the bus drop-off area to Milwaukee whether or not the project moves forward. In the past a fence prevented a bus drop-off in front of the school, but the fence has been removed and that it would be more convenient for the students to get to their classrooms from Milwaukee than from Waveland, he said. 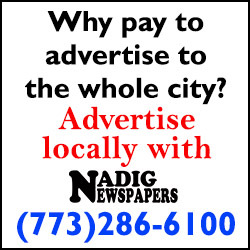 The transportation plans to study whether the impact of closing Waveland would be reduced by reversing the direction of an existing one-way street or if a one-way street could be made two-ways, although several of the streets are not wide enough for the two-way option, Jakobsen said. Concerns also were raised that closing Waveland and hosting school soccer games would worsen parking congestion in the neighborhood. Parking is allowed on both sides of Waveland, but on school days there are parking restrictions on the south side of the street. Arena said that Schurz will be allowing use of its 100-space parking lot across from the school for events on the field and that the neighborhood next year will be receiving some parking relief when 70 new parking spaces will be built at the nearby Grayland Metra Station, 3729 N. Kilbourn Ave. The number of spectators at city high school soccer games is typically 30 to 50 people, Kramer said. Spectator stands are not planned for the soccer field. Not all residents spoke against the closing of Waveland. One woman said that vacating Waveland for the project would reduce the amount of cut-through traffic in the neighborhood. “They blow by stop signs,” she said. A recent Schurz graduate said that some inconvenience getting to and from his home was worth it because the students deserved better sports facilities. 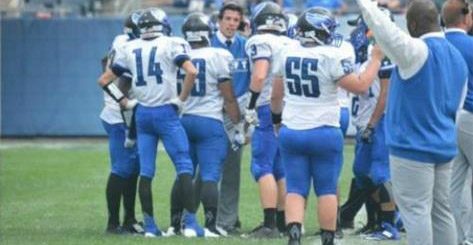 Earlier in the meeting school officials characterized the current athletic field as grossly inferior to those at their suburban counterparts and blamed the field’s poor condition for causing injuries. Residents have expressed concern that the leasing the soccer to adult soccer leagues would cause noise and other problems, but both Arena and Kramer said that rental to adult leagues would be prohibited. A limited-use agreement with the Chicago Park District, which would manage the field, would restrict rentals to youth and family programming. “For the same reason you don’t want adult leagues, I don’t want adult leagues,” Kramer said at the meeting. Kramer said that the athletic field would not be locked so that residents could use the facility when there are no scheduled activities there. The project, whose fundraising is headed by the Urban School Foundation, is estimated to cost up to $1.5 million, including a $500,000 allocation from the Portage Park Tax Increment Financing District. The “Take the Field” initiative, which is supported by the Pritzker Traubert Family Foundation and which has funded about a dozen other athletic fields, has expressed interest in sponsoring the project. A representative of the field initiative told the crowd that community support for the project would be required before funds from its donors would be spent. Surveys distributed at the meeting by Arena listed nine community concerns about the project and asked residents for their feedback. Those concerns included usage of lights and hours of operation. The use of directional lighting would limit the impact that the lights would on the nearby homes, and timers would be used to make sure that lights are turned off at the scheduled times, park district project manager Bob Foster told the audience. Plans call for the field to have a drainage system. A Schurz soccer coach reported that poor drainage at game sites used by the school often leads to cancellations, while another coach said that his players are forced to run in school hallways due to a lack of adequate facilities. The school does not plan to use the field beyond the early evening, and the community would help determine the available hours for outside programming, according to project officials. “The goal is to build a real relationship with the community,” Kramer said. Kramer said that Schurz would save on transportation expenses since fewer school teams would have to go elsewhere for games and practices. He said that the school spends at least $30,000 a year on travel expenses and that any savings would go toward new computers and other curriculum enhancements. “It would be a very big deal,” Kramer said of the proposed athletic field.